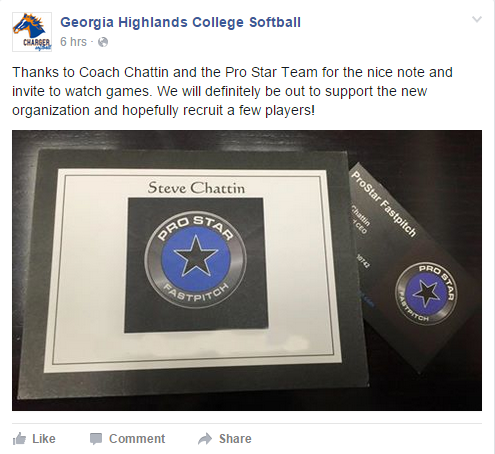 ProStar Fastpitch currently has two teams. On our 18s we have a roster of 12 players. On our 16s we have a roster of 11 players. Of these 23 players 14 are either signed / committed / offered or at the top of a recruiting list. Our goal is have the other 9 recruited by the end of the summer! We are looking to add one additional player to both teams. Position is not as important as ability but the 18s would prefer an OF and the 16s would prefer a P or a C. We would consider any position as many of our players are versatile and can play multiple positions. Our teams play a spring / summer schedule participating in top showcases and tournaments throughout the Southeast and the Midwest. If interested in learning more about our program please email Coach Chattin at prostarfastpitch@gmail.com or text him at 423-488-0695. You can also learn more about our program from our webpage and social media pages. ​Calhoun High School's Anna Taylor Signs with Erskine College. Anna Taylor (Class of 2019) was a verbal commit last spring with Coach Alleen Hawkins and the Erskine College softball team but officially signed today at a ceremony at the Calhoun Media - College and Career Center among friends, family, teachers, coaches and fellow athletes. Anna has been an outstanding 2B/OF for the ProStar Fastpitch Organization and played second base for the Calhoun Lady Jackets helping Calhoun accumulate a 26-10 record this past season in order to make it to the GHSA Elite 8 in the Class AAA state playoffs in Columbus. Throughout her high school career, she was a part of two state championship teams and one runner-up finish playing for the legendary Coach Diane Smith. Anna is in her third year with ProStar Fastpitch and has been a mainstay in the starting line-up. Anna was selected to participate in the Georgia Dugout Club's Senior All-State Game this past weekend. She was also named to the 6 AAA 2nd Team - All Region. Anna is the daughter of Joe and Michele Taylor and has a brother Joseph who is a college freshman. At Calhoun she has maintained a 3.9 GPA and is a member of the Senior Beta Club, serves as Treasurer for the CHS National Honor Society, and also serves as Secretary of the Senior Class Student Government. Anna attends Calhoun First Baptist Church and has volunteered at Calhoun Pre-K as part of the Teaching as a Profession pathway. At Erskine College Anna plans to major in Accounting. Erskine College is a member of Conference Carolinas. Coach Hawkins is a long time collegiate coach with success in multiple conferences but more importantly she is very successful at turning young ladies into strong women through the sport of softball. "I would like to thank my parents for supporting me in all of my endeavors. They have been my biggest fans no matter the activity and they have taught me the concepts of dedication, loyalty and hard work. They have also stressed the importance of family and faith in God. Softball is important to me but it is a game to me and it does not define the person I am or the future I have -- it is a part of my journey," states Anna. "It seems like I have played and loved softball my whole life but it was only in the last couple of years that I really believed and knew I might have the opportunity in college. I have attended camps and visited several campuses but I really fell in love with the Erskine College experience. It was the opportunity to play for Coach Hawkins, the campus itself, and the people I met on my unofficial visit that made me know this is where I wanted to be. I would like to thank all of the coaches I have played for but in particular Coach Smith and the Calhoun staff and Coach Chattin and the ProStar staff. Coach Chattin has been able to help me grow mentally and physically as a player and as a person. I am blessed to have teachers and coaches who have believed in me," Anna shared. "Erskine is getting one of the toughest competitors that has ever played at Calhoun High School. Anna is a fierce team leader who is well respected by all her teammates. She truly loves the game and there is no doubt she will find success at the next level. We will miss her competitiveness, positive attitude and fun she brought to our team," stated Diane Ralston, CHS Softball Coach. "The ProStar family and myself are very excited for Anna as she takes this next step on her journey into adulthood. She is one of the most balanced young ladies in our program and I contribute that to her parents. She works extremely hard and is 100 percent into our practices and games but she also has a strong interest in family, academics and God. Anna came to us from the strong Calhoun High School program and we immediately put high expectations on her. She came to us as an outstanding athlete but I would like to think that she has polished her skills and improved her mental game as a part of ProStar Fastpitch. I am extremely proud of Anna the softball player —Anna the student —but most importantly Anna the person. Her future is unlimited and today is just another day on her journey. But it’s a significant day to reflect on her accomplishments and to let the realization of the next step of her journey to take hold of her future actions. It is truly a beginning and not the end. ProStar and myself have found Anna’s family to be a blessing and I look forward not only to the coming year but to following Anna as her growth continues., “Chattin shared. “I have known Erskine's Coach Hawkins since the mid-80s when she recruited one of my players and I had the pleasure to be her assistant at UGA. I think she is a perfect fit for Anna. She is a strong coach fundamentally but she has a true heart for her players. I expect Anna to continue to blossom as a player and a person under her tutelage," stated ProStar Coach Steve Chattin. ProStar Fastpitch is excited to announce that we have added Bailey Davis a 2021 middle infielder/ outfielder to our 16 under team. Bailey is coming to us from a strong Select program in Utah. She has played for TC Thunder and Utah Fastpitch Club. Her and her parents (Angela and Clint) recently relocated to Ringgold GA. Bailey will be attending Heritage HS. When not playing softball Bailey is an accomplished violinist and likes to draw. She has an older sister that played college softball at BYU-Hawaii and an older brother currently playing collegiate baseball at Southern Virginia University. Due to multiple injuries and defections I have several announcements concerning teams that many of you will not be happy with and quite honestly the Executive Board and the Coaching Staffs have debated over all weekend. This decision was predicated by the extreme number of season ending injuries that have occurred at the 14 and 16 under level. And as the leader of the organization I will take full responsibility for the decision but the complete Executive Board is in agreement and after the coaching staffs discussed it I think they understand the process and what we are attempting to accomplish. I will not beat around the bush but let me say as the person in charge you care for the individual player / you want the individual teams to win / but ultimately you are responsible for the strength of the organization and doing what is best for the Organization as a whole. Effective immediately we are shifting rosters with some 14s going to 16s / some 12s going to 14s and folding the 12s. This will leave seven girls without a team for the last 5 tournaments of the year and for that I apologize. 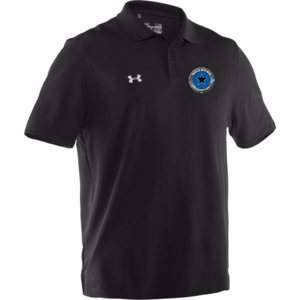 These moves will strengthen the overall roster of the 14s and the 16s and will provide us with versatility in the game lineup. This also gives us a head start on next season as we finish the summer. The remaining seven girls are the ones without a team for the final few weeks. That is not what we wanted and it is not a good thing for us but it is necessary for the good of the whole and I will do everything in my power to assist you in finding another team for the last few tournaments if you wish my help. If you do not want our help I totally understand. The link to the selection show is below and the 14U team selection starts at the 9:10 mark. Local ProStar Fastpitch softball player Rayanna "R.J." Janke is one of the promising amateurs invited to the inaugural Select 30 All American Camp being held Aug. 19-21 in Tuscaloosa, Ala., in conjunction with the 2016 National Pro Fastpitch Championship Series. The pro tournament will run Aug. 19-23. The camp is for girls identified by USA Elite Select as top players in the 2017-22 high school graduation classes. The event will begin with nearly 600 players and will cut down that Sunday to 30 in each age group, and each set of 30 will be divided into two teams for a seven-inning showcase game. All the participants will receive tickets to the NPF games and get to interact with the pros. ​I am excited tonight to announce the addition of Makyah Reynolds to our ProStar 14s roster. Makyah is an OF / 1B that possesses power and speed. She is an 8th grader at CSLA where as a track athlete she runs the 100 , 200, and throws the discus. We expect her to come in and compete for a spot in our OF. Makyah has played Select ball in the Chattanooga area for Fearless and Panthers. She is a product of the Harrison Rec program where she began playing at three years of age. Her goal is to play collegiate softball. Thank you all ProStar girls and families that volunteered this summer for all your hard work and dedication to this program. We added 3 new players to our roster this week. Here is a short synopsis on each..
# 12 Mikayla Teems is going to project as a power hitting C / INF. She is an 02 birth with a graduation date of 2020. She attends North Whitfield and has played Select ball with the Legends. The staff was very impressed with the way she handled herself at tryouts. # 22 Abbi Harden is going to project as an OF / C with an very good work ethic. She is an 02 birth with a graduation date of 2020 but will be playing high school ball at East Hamilton this spring. # 2 Dalyn Muse is an 02 birth with a graduation date of 2020. She currently attends Ashworth Middle and will attend Gordon Central next year. She projects as a P with a potentially strong bat. Defensive position beyond P will be determined. She currently takes pitching from Maddie Monroe. These three were told their future is a year away but I have challenged them to speed up the time table and push for time this summer. They all chose ProStar Fastpitch with no expectations of playing time -- their only expectation is improve and be the best they can be! We are always looking to strengthen our team for the present and the future. ProStar / our coaching staff / and myself have a great track record of taking talented young ladies and making them into elite players if they work hard and put in the time to improve their skills. I expect these three to continue that tradition! If you are interested in attending open tryouts, please email the following information to Coach Chattin at prostarfastpitch@gmail.com or entering it into the comments field on the contact us page. Clinic will feature instruction from the above mentioned staff in the areas of offense, defense, hitting and pitching. Sessions will feature a skill evaluation / practice / drill sessions followed by a live controlled-scrimmages coached and instructed by the collegiate staff. Certified umpires will be used for the controlled scrimmage event. There will also be a general question and answer for players, parents, and coaches attending the event. We limit our enrollment, to give you the best low player-to-coach ratio. More instructors / institutes will be added when the clinic starts to fill to limit/cap. Pre-registration for this event is REQUIRED. Once registration is complete you will recieve a confirmation of enrollment. PLEASE CHECK OUR WEBSITE AND FACEBOOK FOR UPDATES THIS AFTERNOON! 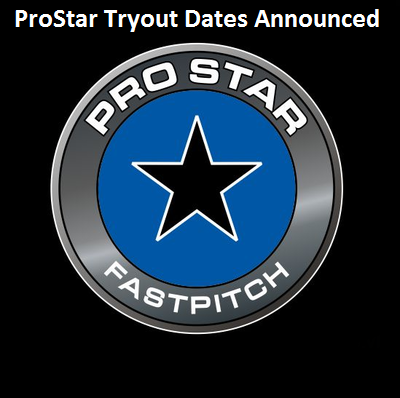 As of now ProStar Fastpitch still has tryouts scheduled today. No decision to cancel and reschedule the date will be made til this afternoon. Sorry for any inconvenience but we cannot control the weather and we need to see the players on the field. I anticipate making a decision by 4pm as we have some players coming from a 90 minute travel distance.